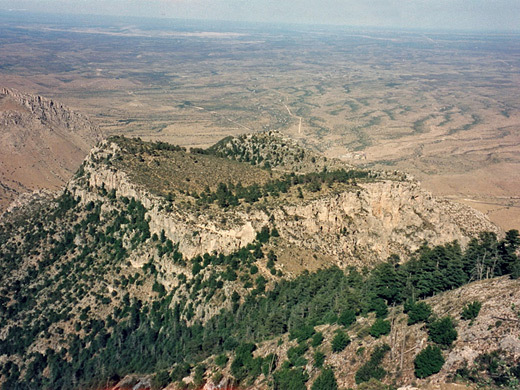 Guadalupe Peak is the highest mountain in Texas (8,749 feet), just 10 miles from the New Mexico border, and it may be climbed by a relatively easy 4.2 mile (one-way) trail that starts from the NPS campground near the main Guadalupe Mountains National Park visitor center. It is an interesting trip, passing different kinds of terrain and a variety of views along the route - of the central Pine Springs Canyon, the desert plains to the south, the flatter, intermediate land within the mountains and finally the peak itself, visible only near the end. The total elevation gain is almost 3,000 feet. Guadalupe Peak Trail topographic map, Guadalupe Mountains location map. Water is available at the trailhead, and an information board shows a detailed map of the route, plus a trail register. The path zig-zags steeply through cacti and shrubbery above the campground to the foot of a steep cliff ridge, where it traverses northwards and diagonally up the ridge, rounds a false summit at the end then turns back south, gaining height steadily. After a while there are several good overlooks of the desert to the south and west. There is then another abrupt change in direction to the north, as the path becomes more wooded and enclosed. 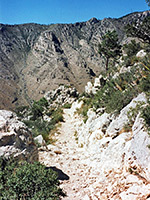 Flattish sections alternate with steeper parts with switchbacks until, 3 miles from the start, the trail reaches a wide level area with few trees and Guadalupe Peak comes into view for the first time. A primitive campsite is located nearby. The final 1.5 miles are along the edge of a canyon, across a footbridge over a deep gully then up to the peak. The last section is quite rocky but not difficult. 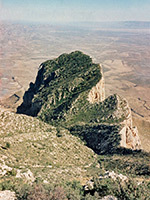 The top has 270° views - only lower peaks to the north prevent seeing the full circle of the horizon. Salt flats stretch into the distance westwards, and the seemingly boundless Chihuahuan Desert extends south and east, beyond the imposing outline of the El Capitan cliffs. Even at this elevation, cacti survive and bloom well into summer, such as several groups of red-flowered echinocereus on the summit. The peak also has an obelisk, a monument to pioneers of the cross-country mail service - the famous Butterfield Overland stage route ran just south of the mountains.